Originally from a rough Chicago neighborhood, Kaya was frequently in fights. Despite a move to Arlington that brought positive change to her family, Kaya still fought at school and skipped classes. She reached out to teachers and advisors for help, but they seemed either busy, or like they didn’t know how. “I can do better than this,” she decided. After the arrest, with public school no longer an option for her, Kaya learned of Texans Can and enrolled at the Carrollton/Farmers Branch campus. During her time at the Can, Kaya never missed a class. 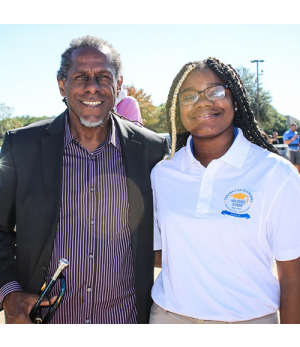 She joined their championship-winning golf team, on which she served as captain; went from failing to straight A’s; passed the SAT with a score of 1270—which is above average—and applied to over thirty colleges. Kaya is also a recipient of the Ann and Nate Levine Scholarship, which she will apply to her college education. Kaya graduated from Texans Can – Dallas in 2019.